The NiPRO Events x Kamdora Giveaway: Win A V.I.P Ticket, Ask BankyW A Question and Stand A Chance To Win Dinner For Two At Eko Hotel! So if you have heard about the NiPRO ‘Networking For Love Event’ holding on the 9th of February at Soul Lounge, then you know that its the place to be! Nigerian Professionals (NiPRO) Network, is a progressive global network of Nigerian young professionals, executives, and entrepreneurs. NiPRO which was established in 2002, hosts business & social networking events in the US, UK and now here in Nigeria. It’s 2017 quarterly event schedule kicks off with this business and social networking event on themed ‘Networking for Love’. The purpose of this event is to bring young professionals together and allow them make business, social or even love connections! Special guest appearances to the event include Cupid & Banky W who will answer questions on business, networking, love and participate in speed networking icebreaker activities. 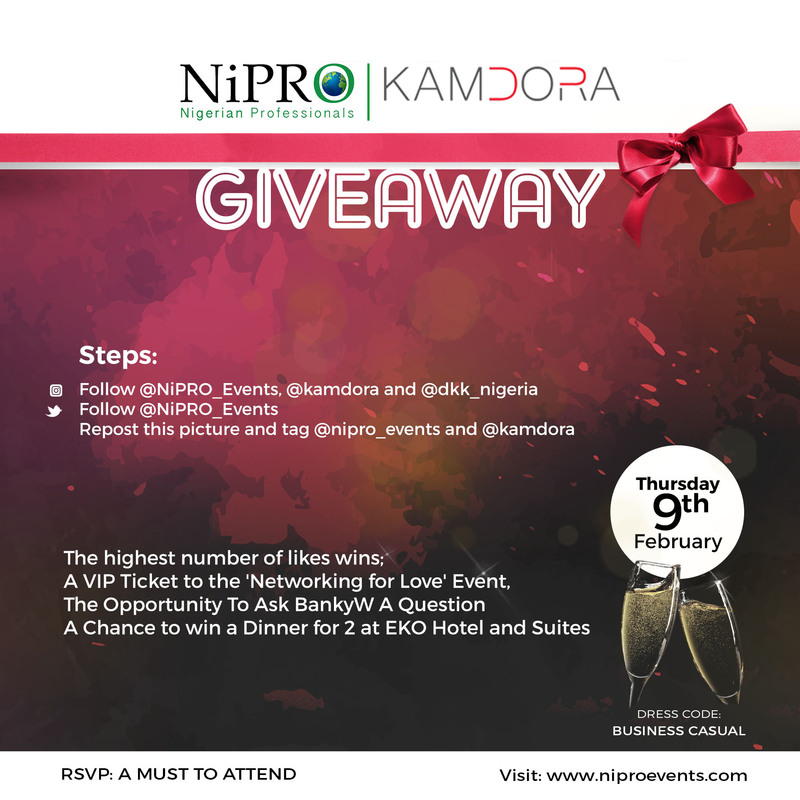 NiPRO Events has partnered with Kamdora to allow one lucky reader the chance to win a V.I.P Ticket to said event, the opportunity to ask BankyW a question and then the chance to win a Dinner for 2 at Eko Hotel and Suites! Talk about a Giveaway! We shared the simple rules of the Giveaway. Be sure to participate. It will be fun! Admission is NOT automatic, registration is required and it is a paid event. At the door, even with payment, admission is at our discretion. Please note that if you are not dressed appropriately are underage or unemployed, your entrance to the event may be denied. GIVEAWAY ENDS ON MONDAY THE 6TH OF FEBRUARY, 2017! Latest Ankara Fashion You Have Not Seen! Cute Short Hairstyles for the week! !